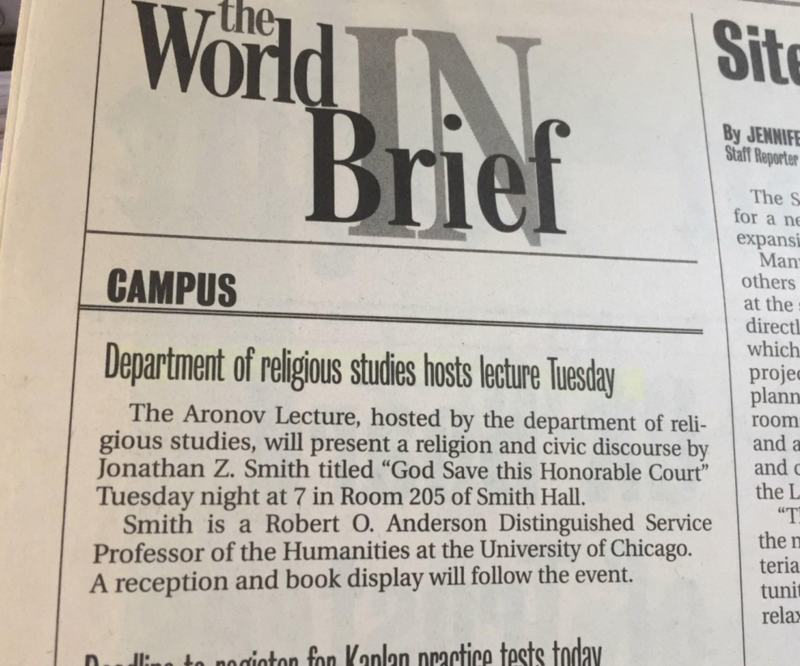 This entry was posted in Faculty Blog, Relevance of Humanities, Religion in Culture and tagged Jonathan Z. Smith by Russell McCutcheon. Bookmark the permalink. Thanks so much for these memories Russell. I will be posting some of my own after the “dust” and “tears” have cleared a bit. We knew this was coming but still, it leaves one with a sense that our world, our field, our little niche of the Academy, is diminished. I would love to hear your other memories. I just listened to his 2010 AAR Plenary…so quintessentially Smith! 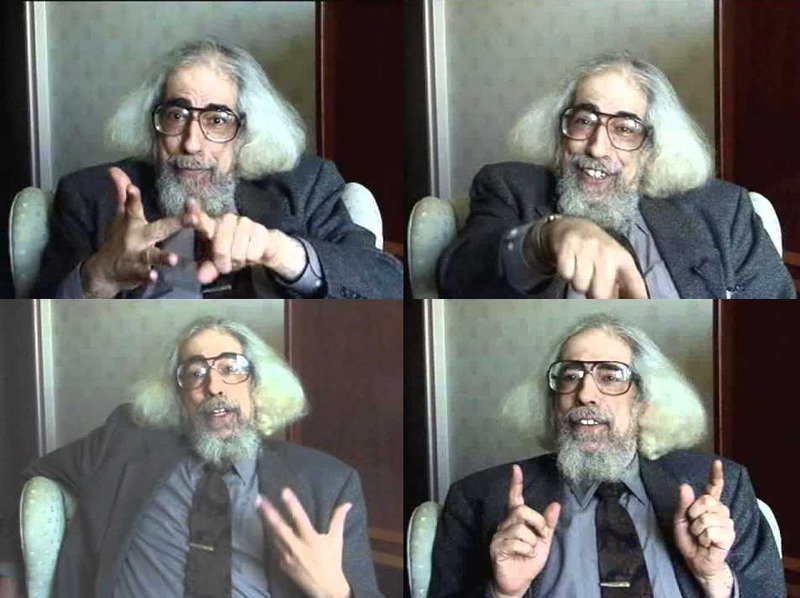 I knew immediately that he was just what I was looking for, namely, someone who came to the subject matter as an historian without any theological axe to grind, but also a historian not only equipped to talk about the factoids of history but to think historically, concretely, materially, as well as philosophically, imaginatively and scrupulously, about the whole range of human experience, cutting across all of the disciplinary boundaries that had turned biblical studies into a patchwork of isolated silos of expertise. A year later I went in to talk with him about selecting a dissertation topic. His response was clear and simple. The topic had to be something I was interested in, and I had to be able to handle the relevant materials. That was it. I felt something take hold inside, the beginnings of excitement. That moment set the tone for the rest of my program. He was a conscientious adviser from beginning to end. After I finished and left behind formal studies of religion I continued to read everything he published. Many years later, the week after the disastrous 2004 presidential election, I was reading what Smith called his biobibliographical essay, the first chapter in Relating Religion, his just-published collection of articles. One of the persistent “preoccupations” he traced through the essay was “thinking” and “thought.” Near the end of the essay I read a sentence that stopped me in my tracks, excited all over again: “Religion is the relentlessly human activity of thinking through a ‘situation. '” “That’s it,” I thought. “That’s the reason I had never stopped reading him.” Everything he wrote had some bearing, however minor, on thinking, its “liveliness,” fascination, exhilaration, vigor, playfulness, imaginativeness, humor and potentially far-reaching consequences. I was also thrilled by this notion of religion, so far removed from that being paraded at the time by the re-elected President’s “faith”-based decision-making. At that moment I realized that Smith’s work is important not just to students of religion, but to the wider public’s notions of religion and its notions of thought. We as a nation in 2018 are living at a time when the need for us to be able to think together about ourselves, our nation, and our world has rarely been more acute. We need all the help we can get. What a wonderful comment–thanks much.